La Magica de MGM sire is Teorema, a 13.2 hand stud which was imported from Columbia. Teorema possesses a great front action as well as a rear drive that leaves you absolutely breathless. 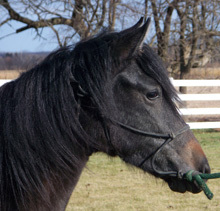 Teorema is out of the world renowned black Paso Fino breeding stallion Amadeus. Teorema is stamping his foals with conformation, quietness of croup, smoothness of gait, color, quick front action and a tremendous desire to work known as BRIO. All of these traits were inherited from these stallions’ legendary bloodlines. The inclusion of bloodlines from Diva I del Ocho, Teorema’s dam, whom was bred by the Fabio Ochoa family at their internationally respected breeding farm, La Loma in Colombia, is nothing short of outstanding. 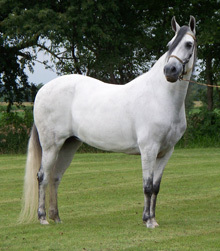 Diva I del Ocho comes with a rare sought after bloodline in the US from Paraiso and JR Resorte. Both of these stallions, Paraiso and JR Resorte, would pass on their outstanding qualities to their offspring. Paraiso and JR Resorte possessed great individual traits and natural abililty which were sought after in the country of Columbia. La Vela de America, La Magica’s dam, is the full sister to the famous Classic Fino Stallion Classico de Plebeyo (Plebeyo x La Classica del Classico). During Classico de Plebeyo show career he has won numerous national and international titles. In addition, he has been in the top ten sire list of the PFHA for many years. La Vela de America also made a name for herself by competing at a very young age and winning the classic fino filly class at Spectrum. Over the past several years, La Vela de America has been retired from the show arena and produced numerous fino offspring.